Review Ranger - Coming Soon! If you have a podcast or other product in iTunes, you have to manually check each country to see your new reviews. 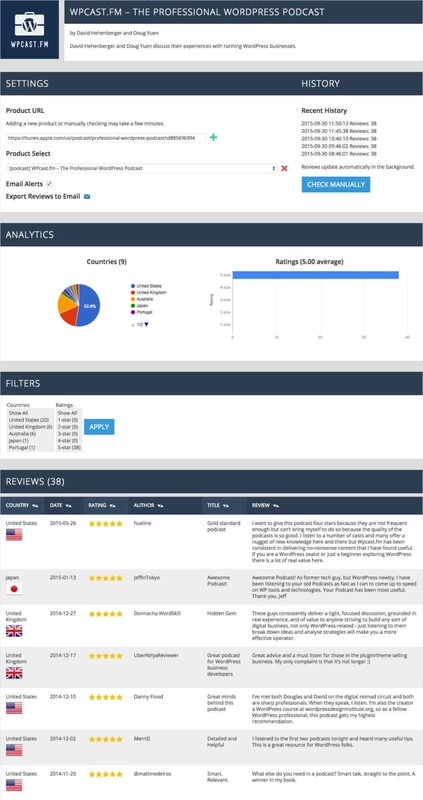 Review Ranger automatically checks for your reviews worldwide, notifies you when you get new reviews, and lets you analyze them easily. No need to log in and manually check for new reviews. You get notified by email when new reviews come in. Easily sort your reviews by country, rating, date, author, title, and content. Filter by country and rating. Get charts showing your distribution of countries and ratings. Export your reviews to a downloadable CSV file. Review Ranger currently tracks reviews on iTunes for podcasts, apps, albums, books, and other products. Integrations with other providers are being considered. For each product, we gather the latest 500 reviews per country, and up to 10,000 reviews total. If you have higher needs or many products, please contact us for more information.